I just walked out to the front of my house where my 1973 Volkswagen Beetle was parked and stopped dead in my tracks, confronted by an ugly void where my car was sitting. It's gone, and I'm on hold with the police as we speak, and I feel sick. I've had my Beetle since I was 18. That car and I have been through an incredible amount together. It's been a constant in my life from when I was in college, outlasting jobs and girlfriends and traveling with me all the way across the country. Every activity I can do I've done in that car at one time or another for better or worse. We've gotten one another out of tricky situations more often than I can count. As much as an unthinking machine can be a friend and companion, my Beetle was to me. It feels more like losing a pet than a car, to be honest. I know that sounds irrational, but that's the truth. The car was parked right in front of my house, by my driveway. I've been parking it there off and on for almost 13 years without any major incidents. It even had a flat tire, and another that was almost flat — I was planning on taking it to get a new set of tires this coming weekend. So whoever took it would have had to tow it, or pump up the tire, which will hold air for a little bit. That part doesn't make sense — who takes a car with a flat? 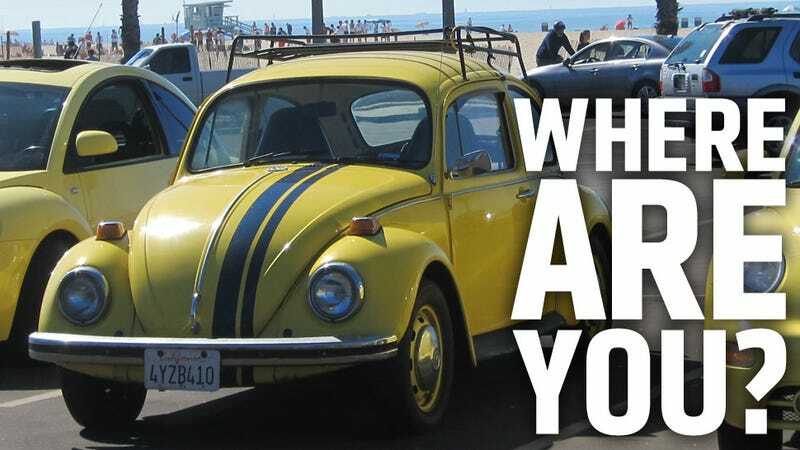 A nearly 40-year old Beetle with a flat? I checked the police impound lot to see if it was towed because it was assumed abandoned or something, but so far it's not in the system. I'm hoping something like that is what happened, but at this moment I don't know. • Yellow, with a dark blue metallic set of two stripes on the front, starting from the valence, going over the hood, and continuing to the base of the windshield. • There is a penny welded on the corner of the gas tank, visible from inside the trunk. • It has an aftermarket muffler with one exhaust pipe instead of the stock two. • It has a dark metallic blue all-metal roof rack. • Inside there's a baby seat, probably some of Otto's toys, an 8-Ball shift knob, an iPhone dock in the ashtray (and the ashtray shift pattern marking is for a semi-auto), an old faded Polaroid of my late father on the glove box, and the speedo is from a '68, because I liked the way it looked more. • The stock steel rims are painted yellow to match the body. So, kind Jalops, I'm humbly asking you for help. Please keep your eyes open for 1973 Beetles, especially yellow ones. I'll try and check eBay and Craigslist, but any extra eyes there would help as well. This car is absolutely saturated in sentimental value to me, and the thought of it being abused or destroyed or anything like that absolutely guts me. I'm trying to stay hopeful that my Bug will be recovered, and I feel incredibly lucky to have this particular outlet to issue my plea for help. The collective Jaloposphere has achieved some amazing things in the past, and I hope this goal, selfish as it is, will be fortunate as well. Regardless of what happens, I want to preemptively thank everyone for whatever help they can give, and I hope very much to be posting some reunion pictures very soon.